ConnectShip, Inc. and iShip, Inc. are two wholly owned, independent subsidiaries of UPS that operate jointly as ConnectShip to provide both on-premise and off-premise multi-carrier shipping solutions. ConnectShip works with regional, national, and international carriers to provide carrier compliance to the ConnectShip partner network and customers. Partner companies then extend the ConnectShip patented multi-carrier logistic technology solutions to enterprise and mid-sized companies globally. Thirty-eight percent of the top 100 Fortune® 500 companies rely on ConnectShip as their one source for carrier compliant labels, documentation, electronic manifesting, and reporting for small package, LTL and air freight shipments. With more than 35 years of experience in shipping and software development, ConnectShip provides reliable carrier compliance for multi-carrier, multi-modal, multi-platform shipping optimization. ConnectShip supports shipping from 50 origin countries and territories via small package, LTL, and freight carriers. ConnectShip is a UPS Ready Certified Solution Provider for global shipping, USPS MAC Certified, and is certified on FedEx Ship Manager Server (FSMS) for Canada and the U.S.
ConnectShip offers the financial security of UPS, technological expertise in shipping with both on and off-premise solutions, and a well-known history of innovation to help you prepare for the future. 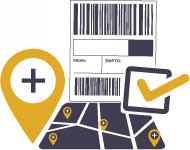 Progistics is the patented technology and compliance engine that powers ConnectShip Toolkit and all on-premise offerings. It enables users to solve their transportation and logistics problems by building shipping functionality into the applications already being used across their enterprise. The Progistics technology integrates seamlessly into ERP, transportation, and warehouse management systems, leveraging industry-standard interfaces and is scalable to fit customer growth and global expansion goals. ConnectShip has a private cloud data center located in Bellevue, Washington with redundancy in Tulsa, Oklahoma. The physically and logically secure data center is designed specifically to support multi-tenant shipping systems and averages more than 350,000 shipping transactions per day while maintaining 99.99% uptime. UPS recognized synergies between two subsidiary companies, ConnectShip and iShip, that would strengthen and diversify both entities if operating as one. The two companies began working together in 2011, but both ConnectShip and iShip have their own history of innovations in logistics technology. UPS purchased TanData Corporation on August 15, 2001 and formed ConnectShip. The history of the ConnectShip innovation began in 1980 when TanData was created by A.R. Tandy. TanData Corporation pioneered the use of client-server technology to build the technology that has evolved into the powerful patented Progistics carrier compliance engine. ConnectShip now holds multiple patents covering technologies for shipping automation. iShip, became a wholly owned subsidiary of UPS in 2001, but like ConnectShip, the iShip technology has much deeper roots. iShip was founded in 1997 and created the first ever UPS shipping label over the internet on April 15th, 1998. iShip holds multiple patents surrounding the rating and creation of shipping labels over the internet and cloud-based technologies. iShip solutions are used in over 8,000 locations. To speak with a representative about the advantages of choosing ConnectShip solutions, call 866-461-4441 or contact us.